Steve O’Neal lives with his three kids and wife in Bolinas, on the ocean, just north of San Francisco. It’s his dream location to raise a family. “We’re next to this progressive, urban city," O’Neal said. “Yet we’re in the middle of a nature park.” But there’s one big problem: all the empty homes. O’Neal's neighborhood is filled with vacant houses. Out of the roughly 350 homes, he estimates only 20 or 30 have someone living in them on most weekdays. 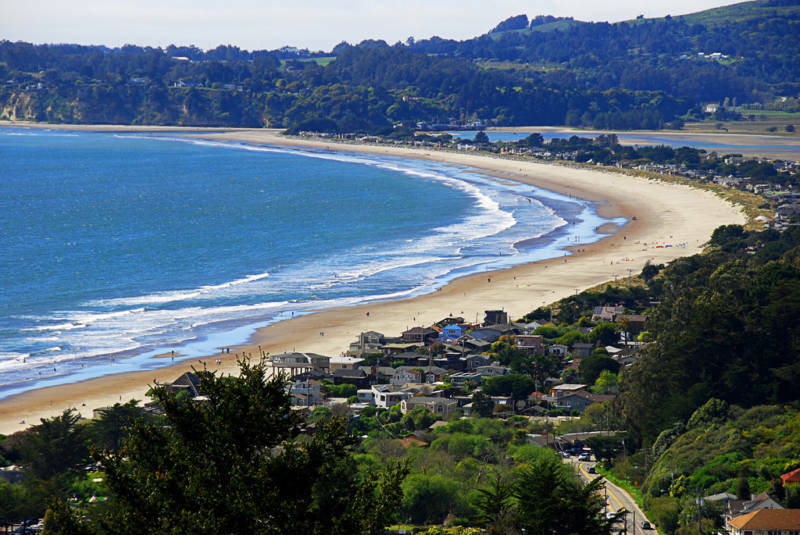 Stinson Beach and Bolinas have always been popular vacation destinations, but O’Neal says now with services like Homeaway, VRBO and Airbnb, there are more short-term vacation rentals than ever before. And he thinks that's making it even harder for local families to find housing for themselves. Communities around California share O’Neal’s concern that websites like VRBO and Airbnb are allowing landlords to turn long-term housing for locals into short-term vacation rentals for tourists. However, it’s difficult for communities to get a clear picture of the extent and impact of these rentals. Short-term rental services don’t publicize all of their data, and local governments are not usually given access to the addresses and names of people renting out their homes. San Francisco is an outlier. After a four-year legal battle, the city got the companies to give them a list of hosts. San Francisco has hired staff now to oversee the short-term rentals. Other local governments have turned to outside companies, like Host Compliance, to gather data on the short-term vacation rentals. In Stinson Beach and Bolinas, Steve O’Neal took the job on himself. O’Neal used to live in San Francisco. He made money in real estate and with a telecom business during the dot-com boom. After traveling and living around the world, he and his wife decided Bolinas was the most ideal place to raise his kids. But when he moved here a year ago, he discovered one problem: The number of families was dwindling rapidly. 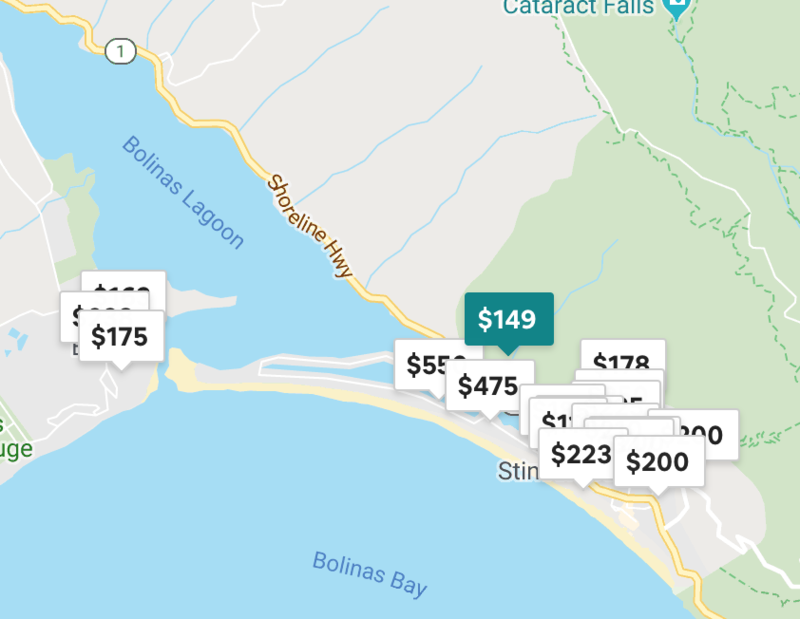 Stinson Beach vacation rentals listed on Airbnb. There are now just 85 kids in the area’s one K-8 elementary school. As recently as 2000, there was double that number. You can also see the decline in residents at the post office. There used to be a waiting list for P.O. boxes. Now 200 of the 700 boxes are empty. O’Neal worries the towns are entering death spiral territory, where some families leave not because the school is bad or the housing unaffordable. To quantify the number and effect of short-term rentals, O'Neal had to become a detective. The first place he visits is Google Earth. He looks at pictures of houses and tries to match them with online listings. He then confirms the addresses by driving by the places himself. Finally, he checks public records to see if the owners are local. When O'Neal finished gathering all his data, he found that 130 homes were being rented by people who didn’t live in the community. That is substantial he said, considering there’s only 1,000 households in all of Bolinas and Stinson, according to the most recent U.S. census data. O’Neal said he has no problem with people renting out a room or in-law for extra income. He’d just like to see limits on how many entire houses are rented to vacationers instead of locals. “It’s kind of a failure of society to have all this housing and nobody in it,” he said. A map of available vacation rentals on Airbnb. This kind of detective work is actually being done by private companies in cities and counties across the state and country. Host Compliance works with over 100 local governments and hires dozens of “desk detectives” to gather information on rentals. The private company even helps collect taxes and writes notices on county or city letterhead to send to those who violate local regulations. Ulrik Binzer is the CEO of Host Compliance. He said the company is filling a niche for communities that don’t have the resources to do this oversight themselves. A town or county may not have the money to hire people for an “Office of Short-Term Rentals,” like San Francisco established. With some 4 million short-term rentals across the country, Binzer said there is plenty of oversight work to do. Around California there's been controversy over the short-term rental services and regulations to limit them. Both Los Angeles and Del Mar, north of San Diego, have enacted contested regulations. In South Lake Tahoe, voters recently passed an ordinance to ban all short-term rentals outside of a designated tourism zone, but some property owners filed a lawsuit against the ordinance and there is pressure to delay implementation of the new rule. Even when regulations do get passed, enforcing them can be another hurdle. San Francisco passed rules in 2014 that did things like put a cap on the number of days a place could be rented out, mandate hosts actually live in the house part-time, and require people to register with the city. But most hosts did not register, which made enforcing the laws difficult. Only in 2018, after much litigation, did the websites agree to send the city a list of registered hosts. O’Neal is a fan of the San Francisco laws, and would like to see similar ones enacted in Bolinas and Stinson. He hopes the data he collected will rally community members behind the idea. But some people who are renting out entires houses for most of the year are worried they'll see a decline in income. O’Neal thinks it's a worthy trade-off if it means more housing for local families. He knows of at least a half-dozen families who are losing their rentals and can’t find another place to live in Bolinas or Stinson Beach. “I mean it’s paradise here; we just need to get the people back,” O’Neal said. “So we need to open up the housing market to get that to happen.” Living in paradise isn’t worth raising his kids in isolation.